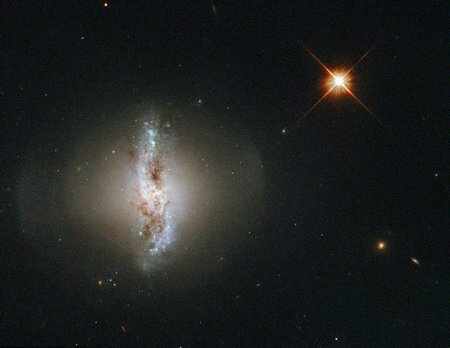 This image shows Arp 230, also known as IC 51, observed by the NASA/ESA Hubble Space Telescope. Arp 230 is a galaxy of an uncommon or peculiar shape, and is therefore part of the Atlas of Peculiar Galaxies produced by Halton Arp. Its irregular shape is thought to be the result of a violent collision with another galaxy sometime in the past. The collision could also be held responsible for the formation of the galaxy’s polar ring. What could be sweeter than to wrap an Olympic-style event with a medal guaranteed before the Medal Race even starts? The Paralympic competition concluded at ISAF Sailing World Cup Miami, Presented by Sunbrella. It was a frustrating finish with little to no breeze forcing several cancellations. Nonetheless the podium places have been decided. January 30, 2015—The U.S. Senate today voted 62 to 36 to pass a bill to permit construction of the Keystone XL pipeline, but declined to tack on an amendment by Senator John McCain that would have repealed the domestic shipbuilding requirement of the Jones Act. 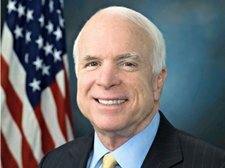 Despite his amendment not being included, Senator McCain voted in favor of the bill. 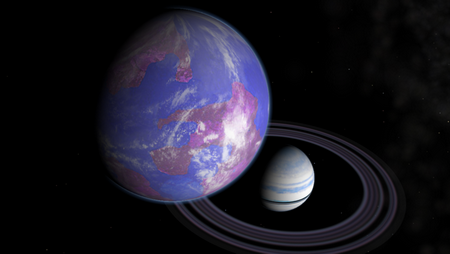 Artist’s impression of a hypothetical Earth-like moon around a Saturn-like exoplanet. This image shows a patch of the southern sky and is based on observations performed by ESA’s Planck satellite at microwave and sub-millimetre wavelengths. The colour scale represents the emission from dust, a minor but crucial component of the interstellar medium that pervades our Milky Way galaxy. 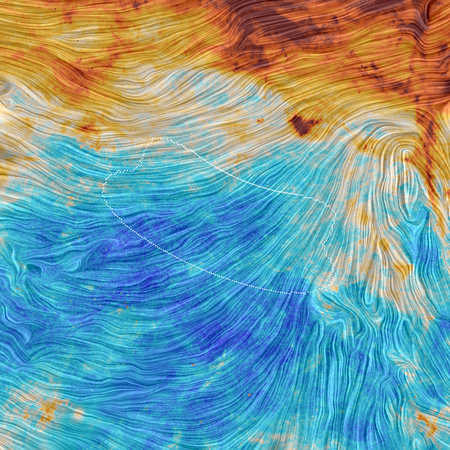 The texture, instead, indicates the orientation of the Galactic magnetic field. It is based on measurements of the direction of the polarised light emitted by the dust. The highlighted region shows the position of a small patch of the sky that was observed with two ground-based experiments at the South Pole, BICEP2 and the Keck Array, and yielding a possible detection of curly B-modes in the polarisation of the Cosmic Microwave Background (CMB), the most ancient light in the history of the Universe. However, a joint analysis of data from BICEP2, the Keck Array, and Planck has later shown that this signal is likely not cosmological in nature, but caused by dust in our Galaxy. The image shows that dust emission is strongest along the plane of the Galaxy, in the upper part of the image, but that it cannot be neglected even in other regions of the sky. The small cloud visible in red, to the upper right of the BICEP2 field, shows dust emission from the Small Magellanic Cloud, a satellite galaxy of the Milky Way. The image spans 60º on each side. 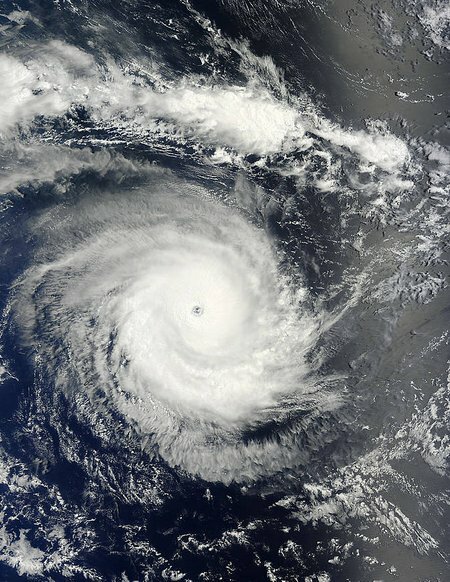 NASAs Terra satellite flew over Tropical Cyclone Eunice in the South Indian Ocean and captured a clear image of its tiny 6 nautical-mile wide eye on Jan. 30 at 05:30 UTC. On Jan. 28, GPM’s Microwave Imager found that rain was falling at a rate of only 30.2 mm (about 1.2 inches) per hour in storms around Eunice’s eye. 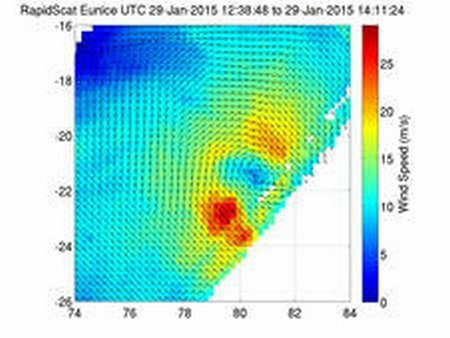 On Jan. 29, 2015, the RapidScat instrument that flies aboard the International Space Station scanned Eunice from 12:38 to 14:11 UTC gathering wind speed data. RapidScat showed that the strongest winds were occurring on the southwestern quadrant of the storm at a rate of 25 to 30 meters per second. 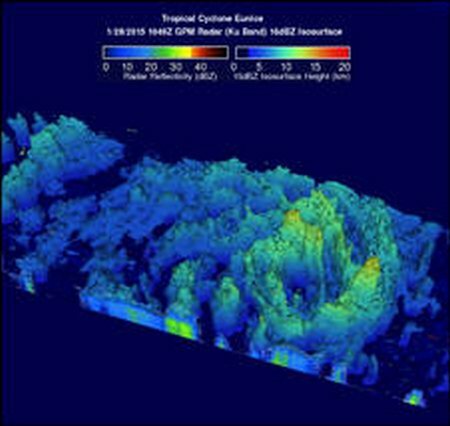 NASA’s RapidScat, GPM and Terra satellite have been actively providing wind, rain and cloud data to forecasters about Tropical Cyclone Eunice. The storm reached Category 5 status on the Saffir-Simpson scale on January 30. WICHITA, Kan., Jan. 29, 2015 – Cessna Aircraft Company, a subsidiary of Textron Aviation Inc., a Textron Inc. (NYSE:TXT) company, today celebrated the roll out of the first production Citation Latitude at the company’s Wichita, Kansas manufacturing facility, just three years since being announced to the market. The assembly of the Latitude features a variety of technological advancements including the use of new automated robotics and ergonomically friendly tooling stations. 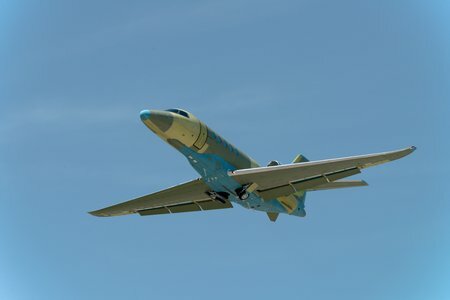 Today’s event is the latest in the aircraft’s progression toward type certification by the Federal Aviation Administration (FAA), which is expected in the second quarter of this year. 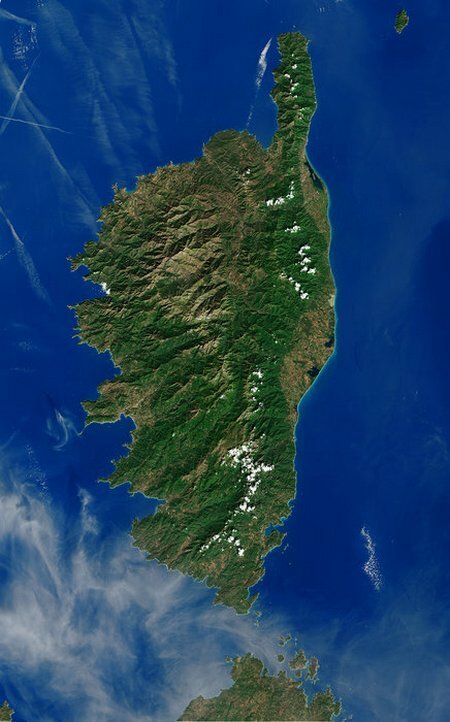 The Mediterranean Sea’s most mountainous island, Corsica, dominates this image from the Landsat-8 satellite. 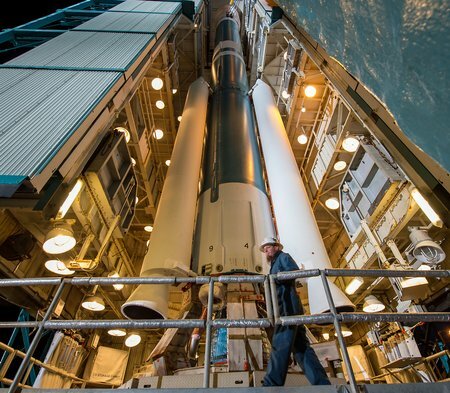 A worker is seen preparing the launch gantry to be rolled back from the United Launch Alliance Delta II rocket with the Soil Moisture Active Passive (SMAP) observatory onboard, at the Space Launch Complex 2, Wednesday, Jan. 28, 2015, Vandenberg Air Force Base, Calif. Now scheduled to launch early Friday morning, SMAP is NASA’s first Earth-observing satellite designed to collect global observations of surface soil moisture and its freeze/thaw state. SMAP will provide high resolution global measurements of soil moisture from space. The data will be used to enhance scientists’ understanding of the processes that link Earth’s water, energy, and carbon cycles.